This task forms the basis for the mechanics of the whole game: you’re not just trying to get your character to the end of the level (like in a Mario game), but rather working through how to get the the entire sepulcher-carrying chariot to the end. 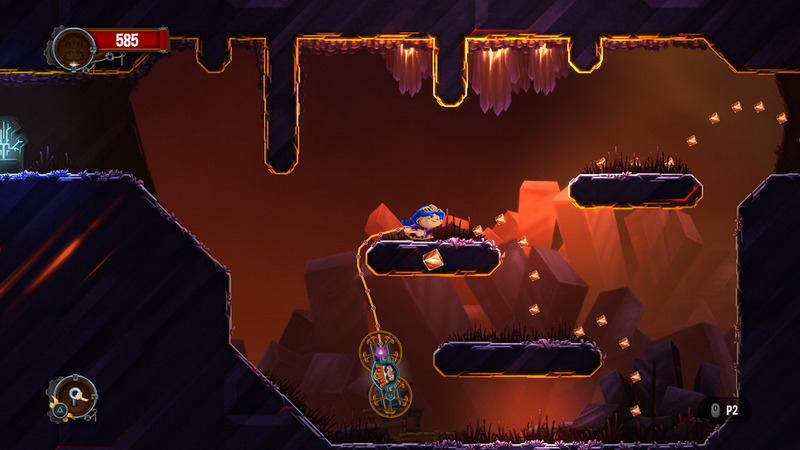 To overcome the obstacles in the level, you’ll push and pull the chariot, use ropes to drag it up and over platforms, and make use of a variety of other gadgets. It’s these mechanics that make up the bulk of the game and its challenge. It sounds simple enough, but the game employs a variety of obstacles to keep each level feeling fresh and making you reconsider the physics and landscape. Chariot can be played either single-player or with a friend (unfortunately, this is only local co-op play, no online support). While the game is still fun single-player, it certainly loses something. You’re limited to certain pathways to complete levels (other paths require a second person to assist) and the game does have a slightly melancholic atmosphere. It’s when playing cooperatively with a friend at your side that the game truly shines. You’ll find yourself having moments of shouting at each other and moments of coordinating a maneuver perfectly without even needing to say anything. It’s truly delightful, and it’s easy to imagine a few tweaks making this a great party game. Another strong point in the game is that it works very well with the Siri Remote. While every game has to have Siri Remote compatibility, it’s clear some games benefit substantially from having a game controller. Not so in the case of Chariot. 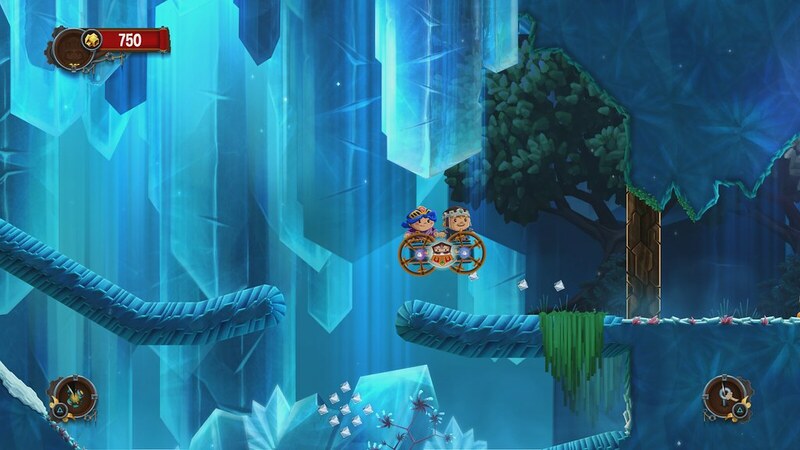 The game requires few buttons and makes interesting use of the gyroscopes for things like climbing up and down ropes. Visually, the game is very attractive. The look is stylized 2D rather than attempting to be photorealistic, and the colors and lighting effects create an interesting blend of somber and cartoonish. One unique twist is that the game can integrate with a Philips Hue light setup to change the colors in your room as you play. 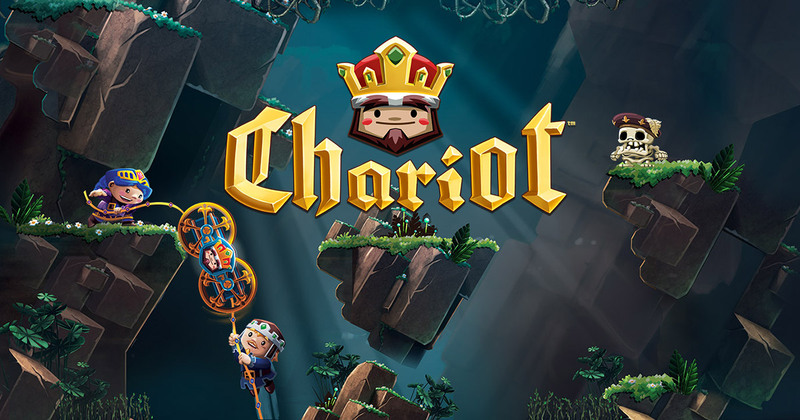 Overall, Chariot is a strong recommend if you have someone to play with. If not, it might be harder to justify the $10 price tag to play a game that’s clearly not geared towards solo play. The presentation is delightful, the puzzle and platformer mechanics interesting, and it’s a great addition to the Apple TV library.